A loving homage to one of the most extraordinary women in the history of creative culture. “To be an artist is a guarantee to your fellow humans that the wear and tear of living will not let you become a murderer,” the great French-American artist Louise Bourgeois (December 11, 1911– May 31, 2010) wrote in her diary toward the end of her long and illustrious life. That perfect fabric metaphor is not coincidental. Psychologists now know that metaphorical thinking is the birthplace of the imagination, “essential to how we communicate, learn, discover, and invent,” and it begins in childhood as young minds transmute the namable things that surround them into fresh metaphors for the unnamable things that they experience inside. Born into a family that restored tapestries for a living, Bourgeois wove the world of colorful textiles into her imagination and into the very work that would establish her as one of the most important and influential artists of the twentieth century. It was in this family trade that she came to see her beloved mother as a deft, patient spider repairing broken threads — the metaphor at the heart of the iconic large-scale spider sculptures for which Bourgeois is best known and which earned her the moniker Spiderwoman. 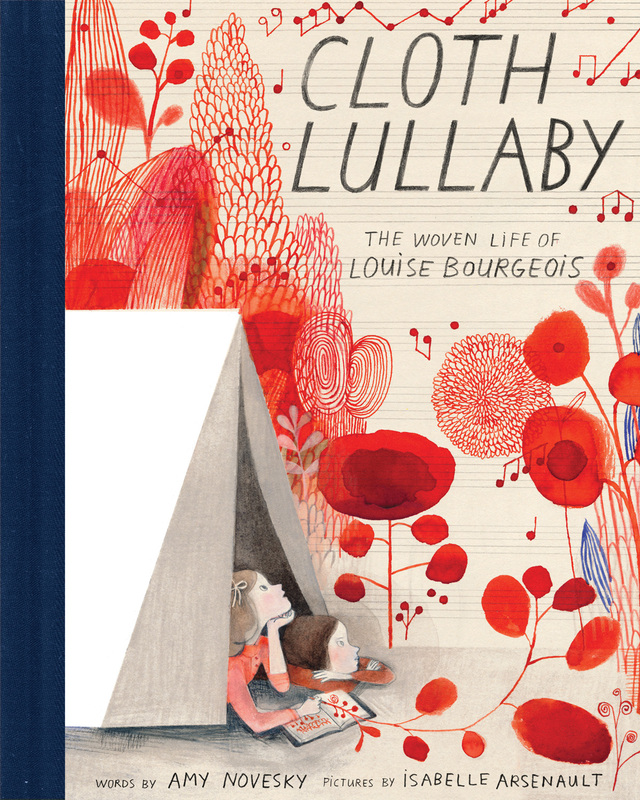 In Cloth Lullaby: The Woven Life of Louise Bourgeois (public library) — one of four marvelous children’s books about the life of ideas I recently reviewed for The New York Times and a crowning curio among the loveliest picture-books celebrating cultural icons — writer Amy Novesky and illustrator Isabelle Arsenault trace the thread of Bourgeois’s creative development from the formative years of her unusual childhood to the pinnacle of her success as an artist. Novesky, who has previously authored a children’s book about Billie Holiday, tells the story of Bourgeois’s life in a wonderfully lyrical way. Arsenault — whom I have long considered one of the most gifted and unrepeatable artists of our time, the kind whose books will be cherished a century from now — carries the story with her soft yet vibrantly expressive illustrations. Louise kept diaries of her days. And in a cloth tent pitched in the garden, she and her siblings would stay till the dark surprised them, the light from the house, and the sound of a Verdi opera, far away through the trees. Sometimes, they’d spend the night, and Louise would study the web of stars, imagine her place in the universe, and weep, then fall asleep to the rhythmic rock and murmur of river water. The ever-flowing blue strand of the river becomes the thread of continuity across Bourgeois’s life. It flows into the Siene and takes young Louise along to Paris, where she attends university studying mathematics and astronomy. Bourgeois’s studies are severed by her mother’s sudden death, the devastation of which drives the young woman to abandon science and turn to the certain uncertainty of art. She cuts up all the fabric she owns — her dresses, her bed linens, her new husband’s handkerchiefs — and spends the remainder of her life making it and making herself whole again, putting it all together into cloth sculptures, colorful hand-sewn spirals, cloth drawings, cloth books, and many, many, many spiders. With the remaining fabric of her life, Louise wove together a cloth lullaby. She wove the river that raised her — maternal pinks, blues in watery hues. She wove a mother sewing in the sun, a girl falling asleep beneath the stars, and everything she’d ever loved. When she was done, all of her spiders beside her, she held the river and let it rock her again. Complement the unbelievably beautiful and poetic Cloth Lullaby, bound in a perfect blue fabric spine, with the picture-book biographies of Frida Kahlo, e.e. cummings, Pablo Neruda, Jane Goodall, Albert Einstein, and Nellie Bly, then revisit Bourgeois’s insightful diary reflections on art, integrity, and the key to creative confidence.